At baking time, loaves should be slashed. This means that cuts are made on top with a very sharp blade. These cuts are to create weak spots in the crust, and it's from these (like chimneys), that steam and CO2 can escape from the dough and that's how you get well risen bread. It's not just a decorative thing, but cut well your bread will have a professional look. If you don't slash your bread, it will rise less and have a stronger/harder crust. To slash well, it's no secret, you need a very sharp blade. A knife, even a sharp one, is not enough. The best tool is a professional baker's blade, a kind of razor blade on a plastic handle. But it's rather expensive and hard to find. 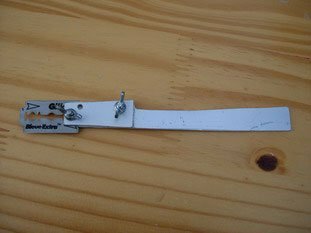 A cheaper solution is to make your own tool, by putting a razor blade on an aluminium handle with two screws. It can then be held safely, and can be dipped in water during use. It's simple and complicated at the same time. 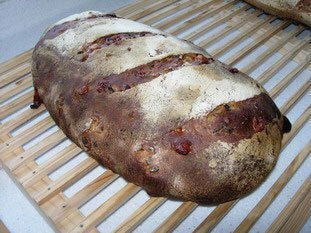 Simple because you just have to makes slits in the dough, and complicated because their shape and direction influence how the bread cooks. Basically there are 3 main French ways to slash bread: classic, saucisson or polka. the bread is slashed with medium sized cuts, more or less along the loaf, but which overlap for about 1/3 of their length. This time the cuts are parallel and diagonally across the loaf. Cuts are crossed, in both directions. It's a cut usually reserved for round loaves. I almost never succeed with the classic cut, so I do my personal version by making cuts along the length but staggered. 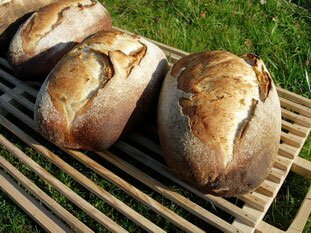 If you cut vertically, you bread will not get "ears" when cooking, those characteristic forms on the top. 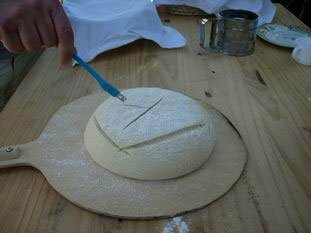 If you cut with the blade at a 45° angle, your bread will get its "ears" during baking, and have a professional look. Slashing bread is not a simple affair, in fact it's an art, the baker's signature. This page only shows a few ways to do it, you can now try to find your own. Why not use an plastic box cutter with a retractable blade? i am very comfortable with knives and blades, but an exposed double sided blade like that is a dangerous proposition(at least use a single edge)especially if it ends up in a sink. the bread looks beautiful and i am sure it tastes great. To jac: Yes you're right, it could be dangerous if considered as a classical cooking tool, but (of course) I don't, and I always wash it apart. Are you sure that an usual cutter, with plastic box, is sharpen enough to cut bread dough? Sometimes with very soft ones, even razor blade is just enough. I was trying to understand the French breads I enjoy so much when in Paris. first learned of the Levain and having brewed beer in my basenment ws looking for5 more information on levain. Your excplanation was the best I found after some time and I believe I can suspend research until making some breads. Tbanks for the translations as wellI am learning to speak french, but when baking I have come to the understanding that to succeed I need both the ingredients , measurements and technique.